Imagine walking into a room and thinking, "whoa" this room is ALIVE! Making your event special is your main focus. What catches the eye of your guests is the colorful presence of a flowing flag display. Exquisite presentation of flags, delivered, choreographed, and tailoring the display with the theme of your event. Every square inch of our business is unique from each silk to each stand, and we bring that to each of your events. FLAGKEEPERS, LLC. 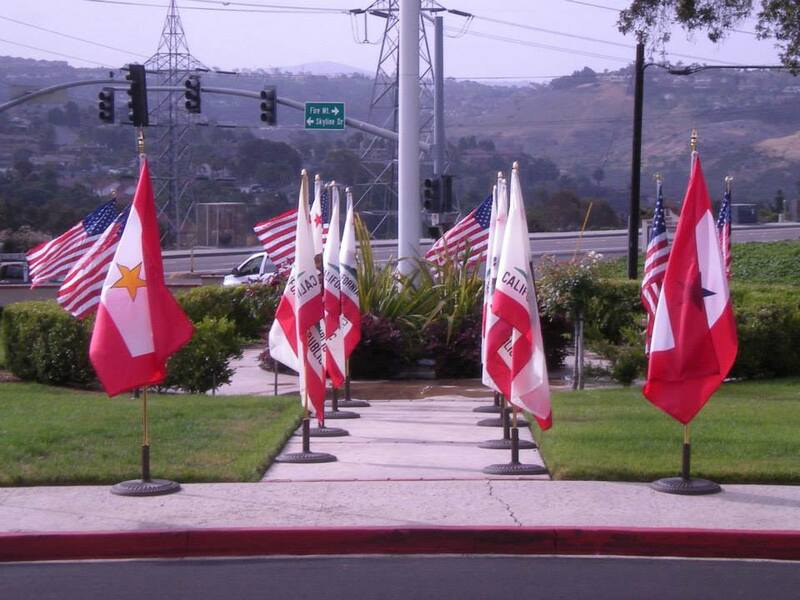 is a North San Diego County custom flag display service. 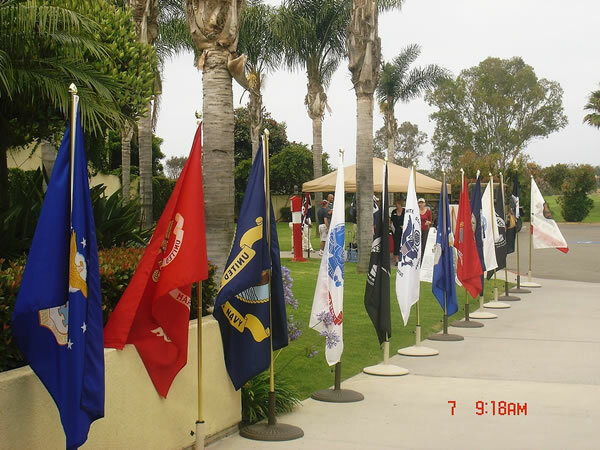 Our flag rental program is designed to provide your event with a custom flag display of your choosing. Each event is a unique setting and demands specific requirements. Our goal, is to provide a flag display package that will fully satisfy your requirements for the event. Once we determine your flag requirements, and the venue for the event, the rest is up to us. We promise you a 100% satisfaction guarantee. Our goal is to make certain that your experience with Flagkeepers' rental service is exceptional. Get ready to sit back, relax and enjoy what our flag display will do to enhance the beauty of your event. Flagkeepers, LLC. shares your excitement and enthusiasm surrounding this event. Our goal is to proudly serve you with timely service, "crisp and clean" flags, and accessories that are in pristine condition. 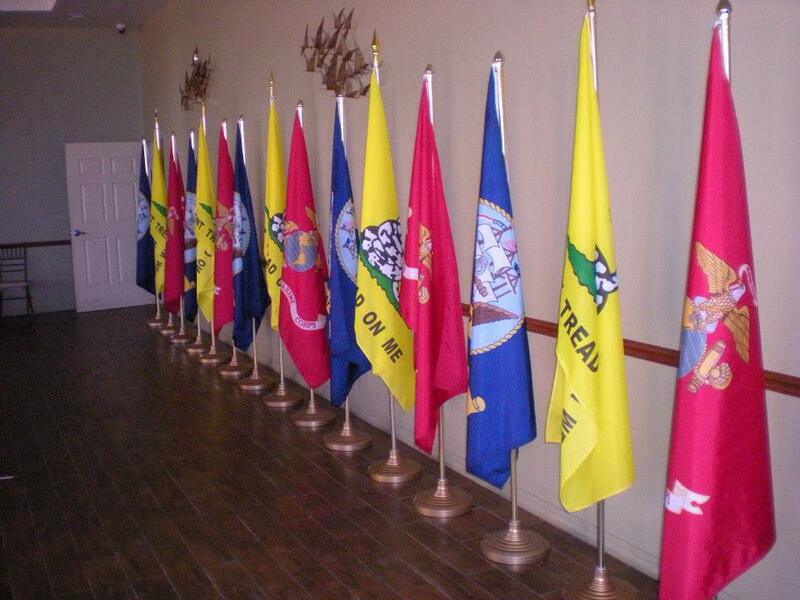 We provide the same level of professional service whether its 1 or 100 flags. We welcome your comments & suggestions as well as your level of satisfaction with our service. You, the customer, is our most important asset. For Flagkeepers, LLC. to better understand your requirements for the event, we would need to schedule a site-visit at your earliest convenience. Parking for loading & unloading of equiptment. We completely understand that setting up an event can be a hectic experience. Our service will make your job a little easier. We make it a point to set up the flag display as early as we can. It is usually in place a couple of hours before the start of the event. Flagkeepers personnel will arrange the flag and lighting display and will handle the moving of all their equipment. We will remain on site until the flag display has been approved by the event coordinator. We will return to strike the display and remove all the equipment at a time as directed by the on-site coordinator.